Wet bulbing is the process where evaporation of moisture results in an increase in dewpoint and a decrease in temperature. Partial wet bulbing results when evaporation of moisture occurs but not enough to saturate the air. Complete web bulbing results when the maximum amount of moisture that can evaporate into the air does evaporate into the air. 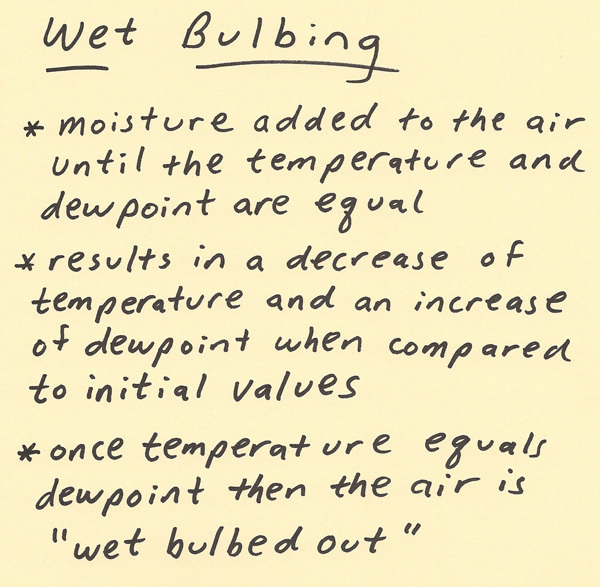 In complete wet bulbing, when the process is complete, the temperature will equal the dewpoint. When complete saturation occurs then the air is “wet bulbed out”. 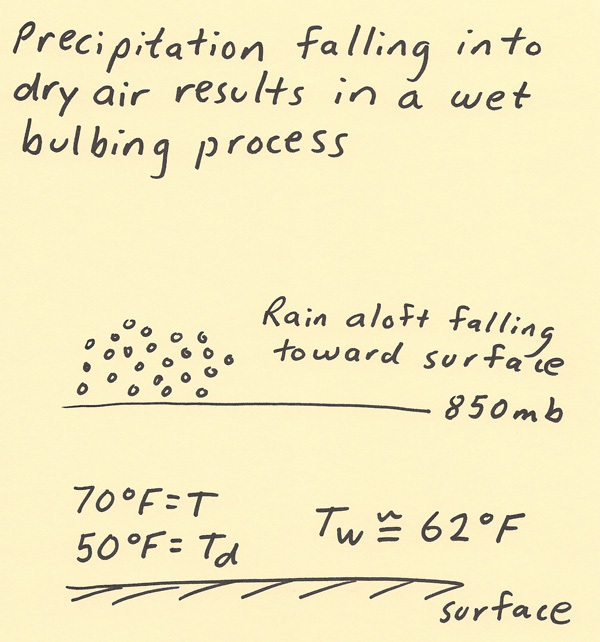 A common scenario to witness the wet bulbing process is when precipitation originating from aloft and falls into a layer of dry air at the surface. The addition of moisture modifies the air mass at the surface by increasing the dewpoint (humidifying the air) and decreasing the temperature (cooling the air). The diagram below shows how the wet bulbing process occurs. In this case, rain has developed aloft from an elevated lifting mechanism. The rain falls into a layer of dry air between the surface and 850 mb. Dry air in meteorology in operational meteorology refers to air that has a low relative humidity, which also occurs when there is a significant difference between the temperature and dewpoint. In this example, there is a 20 degree spread between the surface temperature 70 F and the surface dewpoint 50 F. When the rain falls into this air, the evaporation of moisture will cool the air (latent heat absorption) and moisten the air. In this example the temperature will fall to 62 F and the dewpoint will rise to 62 F. Since the temperature and dewpoint are now equal, the air is saturated. 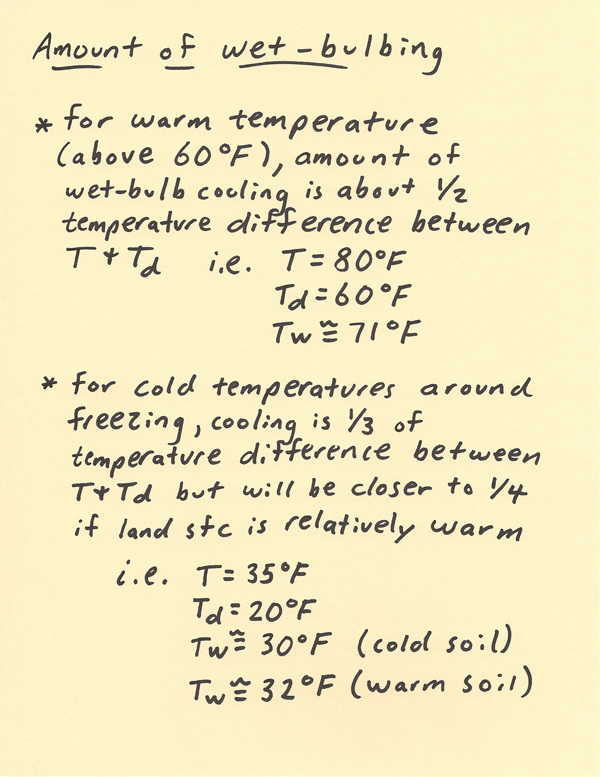 There are two situations in which wet bulb cooling is important to operational meteorology. 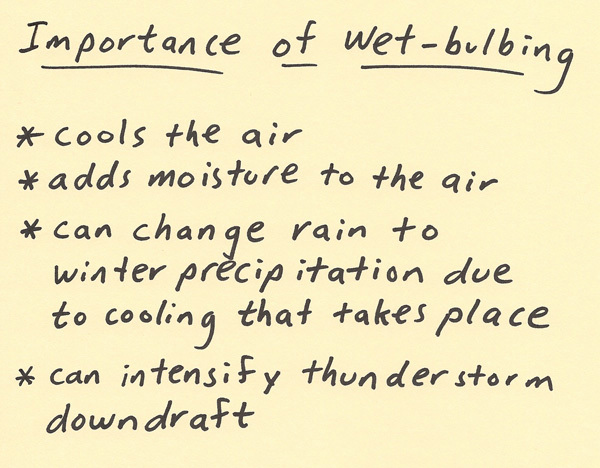 Wet bulb cooling can change one precipitation type into another in a winter weather situation. For example, rain can change to freezing rain, sleet or snow. Freezing rain could change to sleet. Sleet could change to snow. The winter weather transition typically goes from rain, to freezing rain or sleet, to snow as temperatures cool. The second situation in which wet-bulb cooling is important is for thunderstorm downdrafts. A layer of dry air aloft can be modified by precipitation falling through it. This will cool the air and this increased negative buoyancy will produce a stronger downdraft. This next part will discuss the amount of wet bulb cooling that will occur. Warm air has the ability for a large amount of moisture to be evaporated into it as compared to cold air. Thus, wet bulb cooling is more significant in warmer air. There are several additional factors that can determine the amount of wet bulb cooling including soil temperature, initial temperature of the precipitation as it falls into the dry air, and the amount of mixing between air masses. The diagram below shows an example of wet bulb cooling in warm air and cool air.